When it comes to cable alternatives, the Hulu Live TV channels list is one of the best available. It’s so complete you won’t feel like you’re losing anything by cutting the cord on your cable subscription. Hulu Live channels combine live programming from popular networks like ESPN and HGTV with a vast library of on-demand content. As a result, there’s always something worth watching. Most importantly, it costs less than half the average cable bill. Between the live content and backlog of popular shows, we’ve always found shows we enjoy watching on Hulu with Live TV. When you add in that Hulu Live TV channels include ABC, CBS, FOX, and NBC, Hulu Live becomes an attractive option for cord cutters. If you’re looking for a streaming service that comes close to replicating the traditional cable channel lineup, Hulu with Live TV is your best bet. It currently runs $39.99 per month, but in March will raise a bit to $44.99 per month. Learn more about the different plans Hulu offers, which devices you can stream Hulu Live on and all the details about this streaming service in our Hulu with Live TV review. Similar to other streaming services, there is no contract with Hulu Live and you can cancel your subscription at any time without fees or penalties. One of the first things you notice about the Hulu Live TV channel guide is how complete and well-rounded it is. There are over 65 channels included in the Hulu with Live TV channel list. Hulu with live TV channels include popular networks like ESPN, HGTV, Disney Jr, FS1 and FS2, A&E, and USA. Local networks are included as Hulu Live channels for no added fee, which is rare among streaming services. Hulu Live TV includes all live local, regional, and national channels available in your area. A Hulu Live subscription avoids the need for a digital antenna (like the Mohu Leaf that we use) to get local channels. Sports fans will love the fact that Hulu with live TV channels include all of the ESPN channels as well as Fox Sports. When you add in the local channels, it makes Hulu Live one of the cheapest ways to catch all of your favorite games. Other streaming services make you choose between ESPN or Fox Sports channels, or between sports and lifestyle / entertainment channels. Hulu Live TV channels don’t make you choose one or the other. They give you the best and most popular live, local, sports, news and entertainment content for one reasonable monthly cost. Local channels are something to love about the Hulu Live TV channel lineup. As was already mentioned, a Hulu Live subscription includes local channels. Unlike other cable alternatives, which either don’t offer local channels or charge a fee, Hulu Live comes with them. For no extra cost you can enjoy all the live local, regional and national channels available in your area. If you want premium channels or additional channels beyond the 65+ channels included in a Hulu Live subscription, you can add them on for an extra cost. Entertainment Package – $7.99 per month, which includes: American Heroes, CNBC World, Cooking Channel, Destination America, Discovery Family, Discovery Life, DIY Network, FYI, LMN and Science. Español Package – $4.99 per month, which includes: CNN en Español, Discovery en Español, Discovery Familia, ESPN Deportes, History Channel en Español and Universo. When you consider all the Hulu Live TV channels available, it’s clear that Hulu Live offers a convenient way to enjoy all of your favorite TV programming for one monthly fee. Part of the reason Hulu Live is able to offer so many popular channels is because the major TV networks started Hulu. This makes it easy for Hulu Live to offer live and on-demand access to a number of the most popular shows. From drama to comedy to sci-fi, horror and reality TV, all of the hottest shows are available on Hulu Live. If you don’t see your favorite show listed here, chances are great that it is included in the Hulu TV shows list. Does Hulu Live Have A DVR? Along with “what channels do you get with Hulu?” whether or not it comes with a DVR is one of the most asked questions we see about Hulu Live. Hulu Live TV channels include the largest streaming library on the market. It makes sense that you’d want a DVR to help you watch it all. Fifty hours of free DVR storage may be enough for you, unless you are an avid sports fan and have many games you want to record throughout the year. If that’s the case, you can upgrade to Hulu Live’s enhanced cloud DVR option. The extra 150 hours of recording will cost you an extra $14.99 per month. If you record a lot of content, you may find that add-on worth the cost. Another add-on your household may appreciate is the unlimited screens add-on. With so many Hulu Live TV channels to enjoy, your family may want to watch three or more different shows at once, all on various devices. If that’s the case, you may want to upgrade beyond the two screens at once option, which is included in the base subscription. Adding unlimited screens will cost you $14.99 per month. Again, that may be too steep for you, but if your family is constantly fighting over the remote, you may find it worth the cost. In addition to answering the question of “what channels does Hulu have?” hopefully this review has shown all that comes with a Hulu Live subscription. Having tried the service ourselves many times, we can say from firsthand experience that Hulu Live offers the closest experience to cable on the market. One of the best features is the amount of on-demand content you get with a Hulu Live subscription. Not only can you watch first run episodes of your favorite shows when they air, you can catch up on all the past episodes easily. Finally, it’s also fun and easy to discover new shows on Hulu Live. We did that recently with DuckTales, and found a new family favorite to enjoy. If you’re looking for an affordable cord cutting solution but still want to be able to watch ESPN without cable and plenty of other popular content from local and major networks, give Hulu Live a try. As is the case with all the popular streaming services, Hulu Live offers a 7-day free trial to test drive their content experience for yourself. What other questions do you have about Hulu Live TV channels? What channel(s) have you had a hard time finding access to on streaming services? Is cable worth the $110 average price tag? 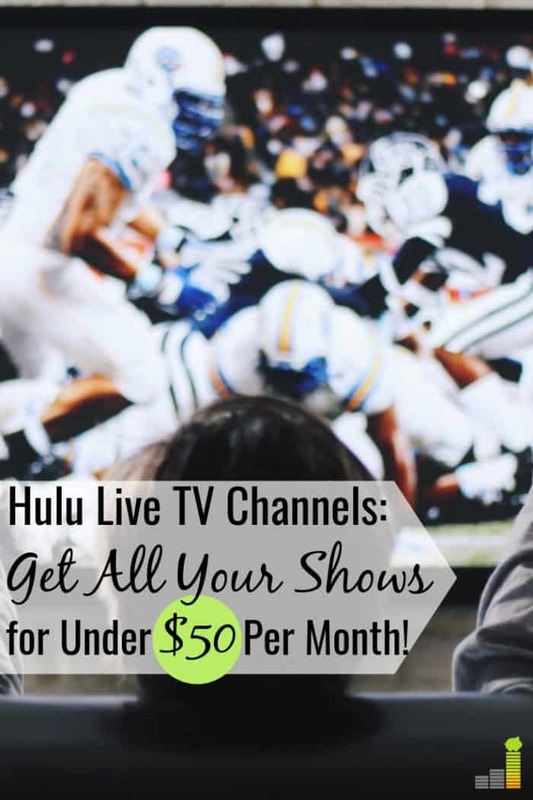 The post Hulu Live TV Channels List 2019: The Complete Guide appeared first on Frugal Rules.